Absolute: Nostalgia is a deep painting from a deep place. 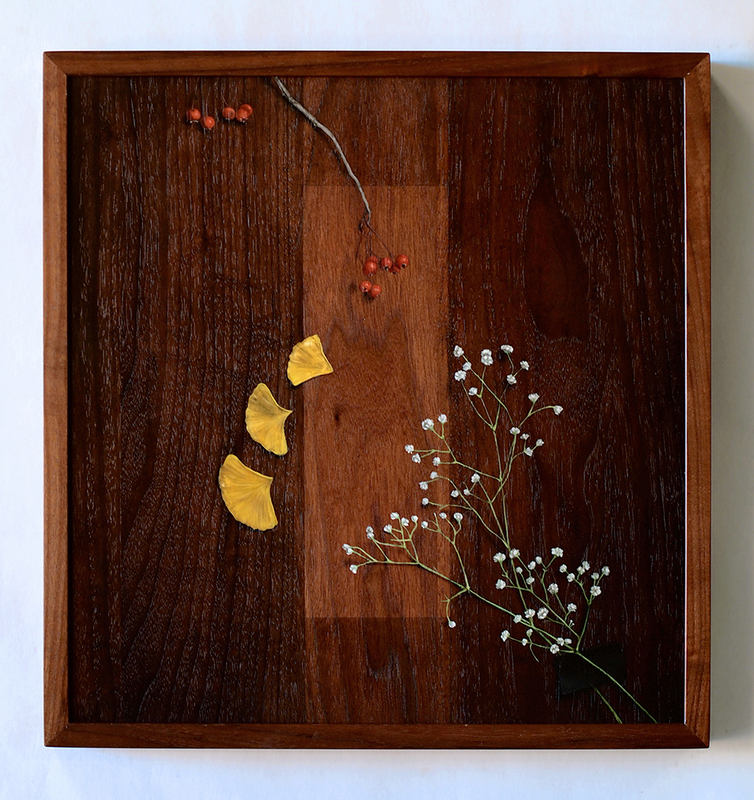 Three ginkgo biloba leaves, yellowed and fallen, arch their way down the center of a walnut panel. Flanking the ginkgo are a set of baby’s breath flowers angling in from the lower right corner. Tucked neatly at the bottom of the foliage is a small black card. Draping down from the top are clusters of vibrant red-orange berries; fruit from the green hawthorn tree. Subtle color changes to the wood grain show a neatly vertical composition. A gradient of rectangles radiate from the center. Watch how it was made and see more images below the article. The bright yellow leaves strike your eyes first, almost spilling out from the central rectangle. 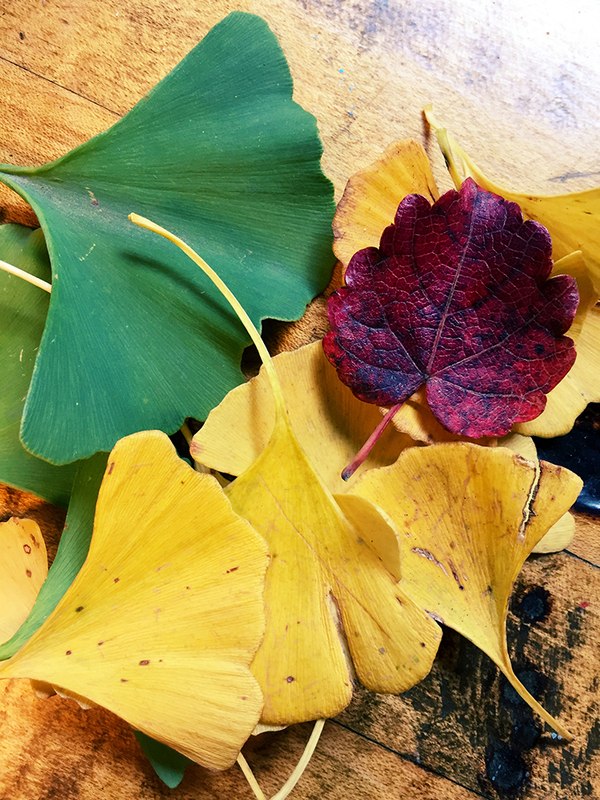 The long-standing myth that the ginkgo tree has memory-enhancing capabilities may be pseudoscience, but it clearly represents just how reverent humans are for the ginkgo. If you’re lucky enough to know where one lives, you most likely have a special memory associated with that spot. Maybe you collect their chromatic leaves when they fall, or fondly remember walking past ones giant canopy, or maybe you remember the really terrible smell that certain trees produce. In any case, they make sure their presence is known. In fact, simply posting the painting process on social media, a number of people started telling me about their favorite ginkgo tree memory. We seem to have a collective consciousness that takes note of the ginkgo. This is the diving off point from which the rest of the symbolism takes over. Several years ago I found an antique dressing table left with no home. The shape and age of wood indicates that its from 1930-40s Art Deco period. Several coats of gaudy turquoise oil paint were applied between the original lacquer and under cheap white acrylic paint — FYI not the correct application order to allow for adhesion. It needed some love. Chemical strippers can take away the nutrients in the wood and can re-dry old paint deeper into the grain, so I typically avoid them. A heat-gun provided just the right initiative to bubble up the layers, leaving spotty sections of original clear-coat to sand off later. You can see this in my process video. 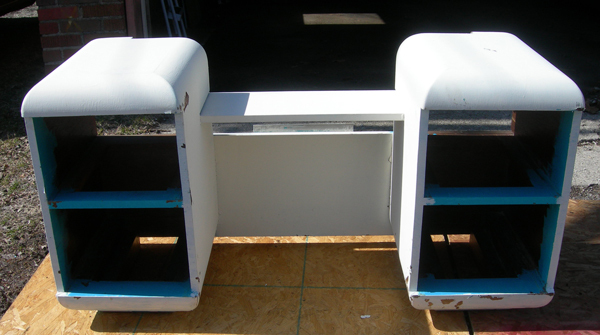 The vanity sat in assembled sections for a few years until I found the ambition to peel and sand off the remaining coats of paint from a few sections. The first set of leaves were taken from a medium-sized tree breaking its way through a victorian brick sidewalk. Located in the historic south end of town, rows of old brick homes are tightly tucked along equally old roads. Eighteen years ago I was a newly transplanted college freshman looking for a cheap place to hang out, do homework, and bring a date. This brought me to a small coffee shop where this ginkgo tree lives. The second set of leaves comes from a massive ginkgo firmly rooted a few blocks away from my studio. It’s a challenger, literally standing ground in the last square footage of small-town quaintness in the middle of an over-commercialized condo-centric development. It’s story is pretty new to me, but when I went to pull leaves from its branches, a bulldozer worked tirelessly in a pile of demolished rubble only 15 ft from the base of the tree. The berried fruit, brash and red, are plucked from the green hawthorn tree outside my studio window. These tiny fruit bud and remain vibrant for a large portion of the winter months; an echo of the vibrancy of life yelling and repeating into the cold void. A black card is hidden between the stems and tiny blooms of baby’s breadth. Also an echo, this time harkening from earlier in this series of paintings. Naturally, these aren’t just descriptive stories by which the materials were harvested. They are a special set of insights into reading into the symbolism behind the work. Believe it or not, I spend months researching the subjects in my work. Like getting sucked into binge watching your new favorite show, I also dive headfirst into the history and background that accompany the elements in my work. The ginkgo is new to my work and I found some really amazing history belonging to the tree. It is considered a “living fossil”, remaining unchanged for more than 270 million years. With so many millions of years in development, its genome is a whopping 10.6 billion DNA “letters” long (in contrast to human’s 3 billion). It is unique with no ancestors, making it the oldest tree species currently living. Some scientists even believe that the rancid scent given off from the trees was developed to attract dinosaurs. This legendary heavyweight produces chemicals that are foul to insects and can ward off bacteria and fungi. It was one of the few living things to survive the atomic bomb blast in the Japanese city of Hiroshima in 1945 and they can grow for 1000+ years — a true survivor. They are one of the few trees that are a cone bearing in the spring (conifer) and also drop their leaves in autumn (deciduous). 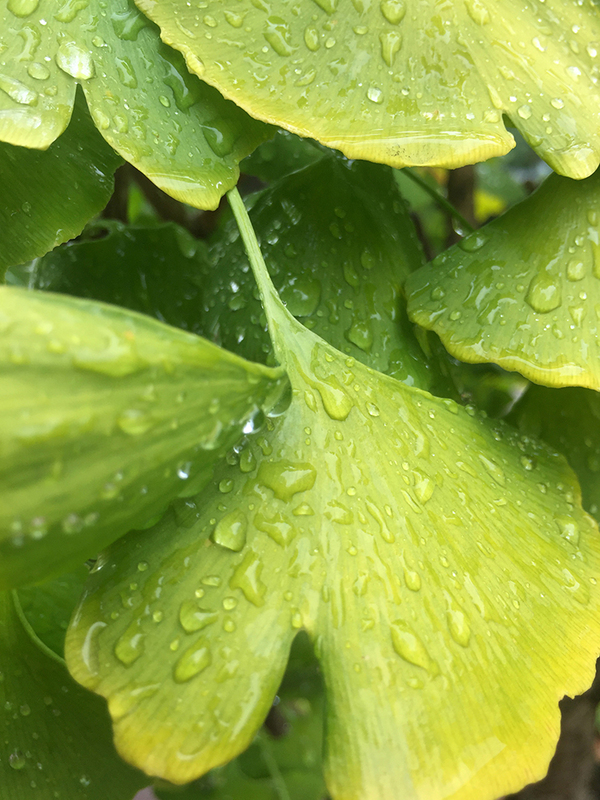 In addition, the ginkgo has 2 genders with males bearing cones and the females bearing a naked plum-like pod that is the seed rather than carrying seeds inside. Time-lapse camera and accessories were purchased through a gracious grant from the Greater Columbus Arts Council.